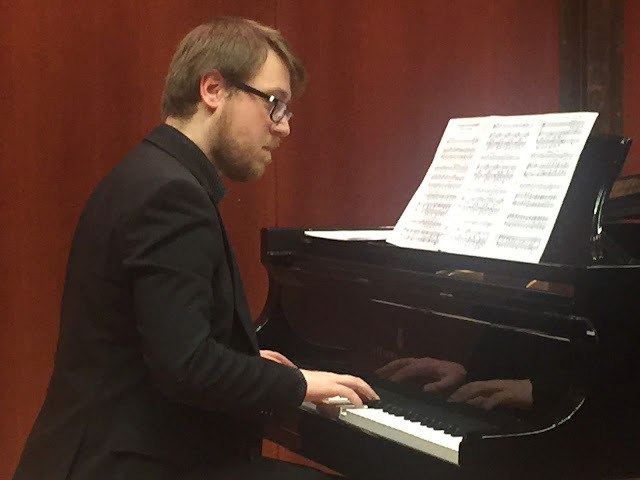 We know very little about the art of collaborative piano from a theoretical or tutelary standpoint; all we know is what we have observed at song recitals. We mostly admire those collaborative pianists with a light touch; we like to hear them support the vocal line without overwhelming the singers; but we enjoy when they let loose in the preludes, postludes, and intervals between verses. We've noticed that the best of them seem to breathe with the singer. We have also observed that there are pianists who seem like superstars when they "fly solo" but are perfectly capable of submerging their style to meet the needs of the singers. Yesterday at Juilliard we had the opportunity to hear two pianists we know and admire who were giving their recitals as fulfillment of the requirements of the Master of Music degree. Both were excellent, having invited co-artists with whom they presumably enjoy working. Something we never considered due to our focus on opera is that collaborative pianists also work with instrumentalists! Mr. Biel opened his program by performing Mozart's Sonata in E minor for Violin and Piano. Indeed, he and Hahnsol Kim made some marvelous music together. This might be one of the loveliest pieces Mozart ever wrote; it is rare that he wrote in a minor key. There was a fluency to the writing and the performing that we enjoyed. Mozart is endlessly inventive. We loved the way each artist echoed the other's dynamics. We were on more familiar territory when Mr. Biel played with the brilliant bass-baritone Cody Quattlebaum. 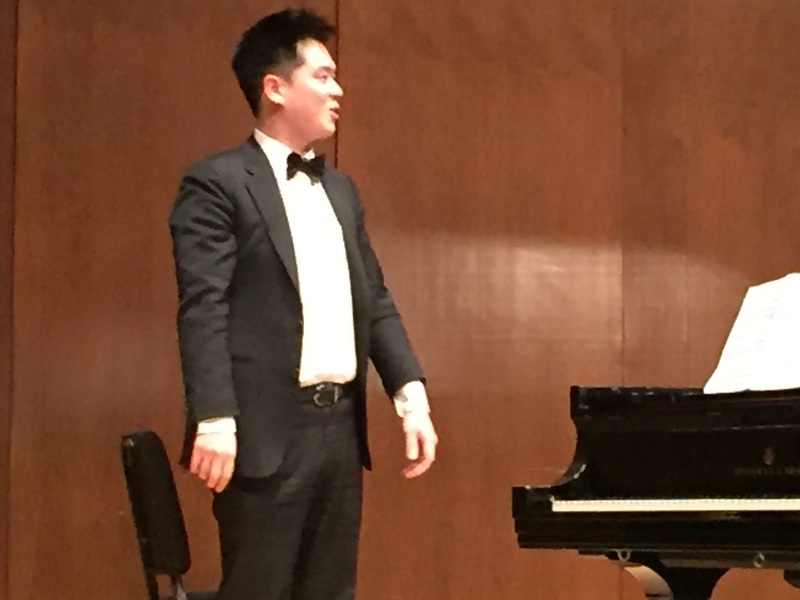 The pair reprised their performance of Jacques Ibert's Chansons de Don Quichotte that we heard recently at the Juilliard Vocal Honors Recital at Alice Tully Hall. We refer readers to that review, which is archived; we have nothing new to add. We were dazzled then and dazzled once more. It is the perfect vehicle for Mr. Q's deeply resonant voice and polished storytelling. The French was darn near perfect. The duo also performed works by Hugo Wolf--Drei Lieder nach Gedichten von Michelangelo and then "Grenzen der Menschheit" from Goethe-Lieder. Bass-baritones like to sing "masculine" music, much of which we find ponderous. But we can say that Mr. Q's German is just as fine as his French, and he has the ability to draw us in because he is so involved with the material that he clearly loves. One aspect that we haven't mentioned is that he achieves greater emotional force when he steps away from the piano and uses the entire stage. It puzzles us that some people don't enjoy the counter-tenor fach. To us, it sounds like an angel is singing. Jakub Jozef Orlinski's otherworldly sound gives us goosebumps! The only work by Karol Szymanowski with which we are familiar is his opera King Roger which we so enjoyed at the Santa Fe Opera (review archived). That he composed hundreds of songs is something we learned on the internet, trying to get information on his Kurpie songs, Op. 58, the first four of which appeared on yesterday's program. Part of our loving these songs has to do with the way Mr. O. and Mr. Biel performed them and the rest has to do with the folklike nature that appeals to our ear the same way that Brahms and Dvorak do. Kurpie, we learned, is an ethnically special part of northeast Poland. The songs were written in 1930 and represent part of a cycle of a dozen songs. Unfortunately, there was no translation provided, not even for the titles of the songs. All we can tell you, pending further information, is that the melodies were gorgeous, the piano part interesting, and that there was plenty of variety. The first song seemed sad, the second lively and staccato, the third a bit somber, and the fourth somehow uneasy. The titles we found on the internet were translated into French and German and did not match with each other. We were surprised to learn that Tadeusz Baird was a mid-20th c. composer because his settings of Shakespeare's sonnets were delightfully melodic and showed none of the irritating features of most 20th c. music. We particularly liked Sonnet #91. 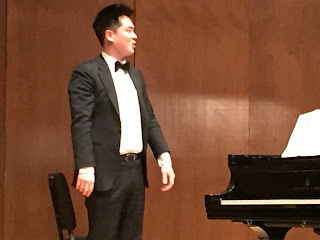 We followed up this splendid recital with part of a recital given by Ho Jae Lee who is also getting his Master of Music degree from Juilliard. He made a splendid partnership with soprano Onadek Winan in Richard Strauss' Brentano Lieder. Ms. Winan has a bright attractive instrument which sweeps up to an expansive and ringing upper register. She has a lovely stage presence and gave "Amor" a charming delivery. We also heard mezzo-soprano Natalia Kutateladze reprise yesterday's performance of selections from Arnold Schonberg's Sechs Lieder, Op. 3. We can understand why she chose these songs; they are highly dramatic and suit the darkness of her voice. She and Mr. Lee worked out the balance very carefully. Mr. Lee also worked well with flutist Yerim Choi in the lovely Fantasie, Op. 79 of Gabriel Faure and the Nocturne et Allegro Scherzando by Philippe Gaubert. We didn't really have the time to stay for the rest of the recital but we couldn't tear ourself away from tenor Joshua Blue's performance of "Una furtiva lagrima" from Donizetti's L'elisir d'amore which was followed by "Kuda, Kuda", Lensky's soul searching aria from Tchaikovsky's Eugene Onegin. We hope to learn the subtleties of accompanying an opera aria with a piano reduction, as contrasted with the voice/piano collaboration for art song. But that will have to wait for another day.